Gonçalo Lélis started his musical studies in the Conservatório de Música de Aveiro Calouste Gulbenkian with Isabel Boiça in 2001. In 2009 he started to study with cellist Pavel Gomziakov and three years later he got accepted in the prestigious Escuela Superior de Musica Reina Sofia in Madrid, where he currently studies with Natalia Shakhovskaya and Ivan Monighetti. Gonçalo participated in master classes with Natalia Gutman, Heinrich Schiff, Truls Mork, Gary Hoffman, Lluis Claret, Valentin Erben, Ralph Gothoni, among others. 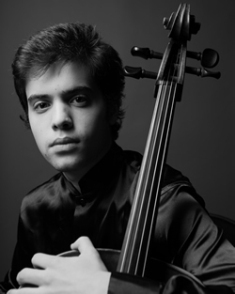 In 2015 he got the 1st Prize in the Premio Jovens Músicos in Portugal, in the cello category. As a soloist he performed with orchestras such as Orquestra Gulbenkian and Orquestra Filarmonia das Beiras (Portugal). In orchestra he played under the baton of András Schiff, Peter Eotvos, Jesus Lopez-Cobos, Stefan Lano, Hansjorg Schellenberger, Gunter Pichler, Josep Pons and others. Besides his solo activity, he is also very active in chamber music, playing over all Spain both in piano trio and string quartet (under the coaching of Marta Gulyas and Heime Muller, accordingly). He is currently aided by Fundacíon Albéniz (Spain). If you are interested in working with Gonçalo, please get in touch with the EMCY Office.